WHY VISIT ALSACE: STRASBOURG, COLMAR, RIBEAUVILLE & RIQUEWIHR? The Alsace region of France is filled with idyllic countryside villages, vineyards growing plump riesling, muscat d’Alsace, pinot gris and gewurztraminer grapes, quaint castles and lots of German influence (pretzels, anyone?). Check out the Travel Honey ALSACE PHOTO GALLERY and ALSACE ITINERARY. WHERE TO STAY IN ALSACE: STRASBOURG, COLMAR, RIBEAUVILLE & RIQUEWIHR? For a smaller village experience, stay in Ribeauville with a population of 5,000 or Riquewihr with a population of 1,200. Ribeauville may have more shopping and a larger historic city center, but Riquewihr is picturesque and more concentrated with several excellent dining options from your doorstep if you choose to stay in the old center. If you prefer a bit more hustle and bustle with a busy nightlife, Strasbourg is the largest city in Alsace with lovely and impressive architecture within its old city center. Le Grand Chalet et Spa ($$$$$) Perfect spot for a getaway outside Colmar, this contemporary, small chalet has design oriented decor and is surrounded by vineyards. Hôtel Régent Petite France & Spa ($$$$) Centrally located hotel in Strasbourg with ultra luxurious spa facilities including a hot tub, sauna, hammam and variety of healing treatments. Hotel Les Haras ($$$) Sleek, minimalist digs right in the center of Strasbourg. Le Haut Koenigsbourg ($$) Small chalet north of Ribeauvillé covered in red vines and flowers. Relaxing countryside ambiance. WHERE TO EAT IN ALSACE: STRASBOURG, COLMAR, RIBEAUVILLE & RIQUEWIHR? La Vignette ($$$$) Best tasting menu in Strasbourg. Small and intimate setting. Le Banquet Des Sophistes ($$$) Hearty fare that warms the souls (the desserts are flawless too). In Strasbourg. Au Relais des Menetriers ($$$) Locally sourced Alsace fare in Ribeauville. Try the fat, grey snails if they’re on the menu when you visit. Restaurant La Grappe d’Or ($$) Come here for the savory meats and potatoes (and the wine)! Located in Riquewihr. WHERE TO GO AT NIGHT IN ALSACE: STRASBOURG, COLMAR, RIBEAUVILLE & RIQUEWIHR? Strasbourg’s student population keeps the city nightlife alive! The more popular areas are clustered around the cathedral, rue des Juifs and rue des Freres. Code Bar ($$) Best for cocktails and hip bartenders. Le Phonographe Bar ($) Good music and even better beers. Les BerThoM ($) Lots of Belgian beer. BEST INSTAGRAM ACCOUNTS FOR ALSACE: STRASBOURG, COLMAR, RIBEAUVILLE & RIQUEWIHR? HOW TO GET TO ALSACE: STRASBOURG, COLMAR, RIBEAUVILLE & RIQUEWIHR? Fly into Strasbourg’s international airport or you can arrive to Strasbourg and Ribeauville by train and all three by bus if you are arriving from within France or other surrounding regions. HOW TO GET AROUND ALSACE: STRASBOURG, COLMAR, RIBEAUVILLE & RIQUEWIHR? 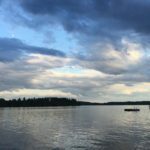 Having a car will allow you the flexibility to explore the region, however it is not impossible to do without. There are many local bus and train lines that travel throughout the region. Alsace being on the Tour de France route, there are many popular bicycle routes if you are feeling a bit more adventurous! BEST ITINERARIES FOR ALSACE: STRASBOURG, COLMAR, RIBEAUVILLE & RIQUEWIHR? 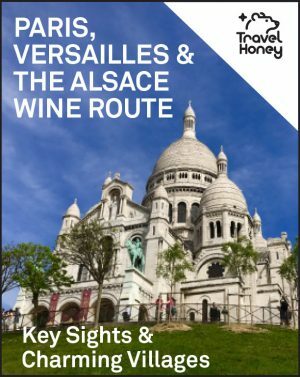 Check out this Travel Honey itinerary for the inside scoop on the Alsace region.